On Friday September 24th I attended a networking practice session put on by the UNR College of Business. In addition to Blivit Design (I sent my entire staff), there were several companies represented. I only spoke with a person from M.A.Z. Inc. Mahsa Ahmadi Zadeh, and a person from IGT woes card I didn’t get. We had a general get together at first where the students were encouraged to just come up to you and start speaking. It was fascinating meeting all of the young, fresh, and un-jaded by reality people. They all seemed very enthusiastic (if perhaps a bit serious). I was invited to the next event on Friday, October 15th from 4 – 5:30 pm in the Harry Reid Engineering Lab building. I’m sure I will be attending, and I would encourage any other professionals from the Reno-Sparks area to contact Jane Bessette, Director Career Connections at the UNR College of Business (Bessette@unr.edu) at 775-682-9144 to get invited yourself. I met these students: Manpreet Kaur, Shayla Zeal, David Loomis, Kate Janes, Timothy Randall, Jared Harvey, John Williams, Brittany Kohlruss, Ceci’lee Grund, Drew Hauser, Jenny Crawford, and Elizabeth Howald. It was a good networking opportunity for me and the students at UNR. I got a chance to implement my changes to the way I teach the beginning computer class in Reno. The way the class runs, we introduce the mouse buttons, the keyboard and some of the special characters, and the shift, control (Ctrl), and escape keys (Esc). Then we move on to the desktop and the three controls that are at the top of every window . This time, I had my students just move their mouse around on the screen before I even showed them the buttons. I just wanted to get them used to the pointer moving around. Next, I introduced them to the “thumb drive” that we always recommend that they buy in order to save their work. I showed them my thumb drive, and I demonstrated how to plug it in upside down (well, kind of) and how to insert it correctly. I demonstrated that on some computers, plugging in a thumb drive doesn’t appear to do anything. I introduced them to icons, and showed them the “My Computer” icon and how the thumb drive I just plugged in could be found there. I showed them two ways of opening up the icon, and then I demonstrated how their “My computer” icon had just the C drive, the A drive, and the D drive (DVD) on it while mine had an extra drive (the thumb drive) that theirs didn’t. Next, I demonstrated opening the thumb drive and then I started the slide show demonstration. This all took a little time, but I think it was more valuable to show them that I could now “see” the thumb drive that I just plugged into the computer. I ran the slide show like normal, but I kind of rushed through the keyboard, because I wanted to do a live demonstration of the keys on an actual keyboard and program. When I got to the slide with the desktop and icons on it, I bailed on the slide show. I showed them the icon for MS Word, and I had them open and close it a few times, maximize, minimize, and “restore down”. Then I had them type a bunch of gibberish on the screen. I told them to use the keyboard the way a little kid plays the piano. They took to that quite well. Next, I showed them how the spell checker was trying to make sense out of the gibberish they just typed. I showed them how it would work with real misspelled words (like the ones I type every day), and then I demonstrated copy and paste using control C and control V. I also showed them undo with control Z and dragging and the mouse to mark text. After this, I had them delete all the junk from the screen, and type in their full names with a period between their first and last names followed by the month and day they were born. (Duncan.Winn0605). Next, I had them chose an 8 character word that they could remember. I told them to use a name followed by a number. After this, I showed them how to save the word file using “save as”, and then I had them exit word and re-enter word to re-load their data file. I had them print their file, and then shrink the window for “Word” down but leave it running. Now I was about an hour into the two hour course, and I had them open up Google and go to Gmail. When they went to the “new user” portion of the program, they already had their user name and passwords saved on an open MS Word window, so I just had them copy and paste it into the Gmail window. This avoided the confusion of attempting to type the password in two times when you can’t see the characters you are typing. Selecting a user name that nobody else is using helped a lot too. One big challenge (even for me) at the end of signing up for a new Gmail account is typing in the messed up characters at the end of the sign up screen. We all tend to misread them, and when you enter them wrong, you have to go back and re-enter your password twice. This process was taking the majority of the time in classes previous to this one. Having the password available for cutting and pasting really proved to be a time saver. We got most people done entering their info with twenty minutes to spare. I may have to try and formalize this lesson plan since it worked so well. I can’t take all the credit for the smooth way this class ran. I couldn’t have done it without the help of Daunine and Robin, my two Pronet helpers. While handing out fliers and business cards to the people in line at the Hilton Career faire, somebody told me that their computer had a password put on the bios that they didn’t know. It was really bad, because it wasn’t just protecting the BIOS settings from alteration, but it was actually preventing the computer from booting. I didn’t know off the top of my head how to fix the problem, so I told them I would research it. First of all, I should have thought of just pulling the CMOS battery out. This will make the CMOS memory loose it’s mind (and any passwords that are protecting it). The only down side it that you will have to put all of the settings back in once the battery is restored. On some motherboards, the battery is actually soldered in. Some of these motherboards will have a jumper that you can move to clear CMOS ram. I found a really great website that has a lot of “backdoor” passwords that the motherboard manufacturers put into their BIOS programs. It’s here How to Reset a BIOS Password. You never really stop learning (unless you’re dead. Then maybe there was one last lesson that you should have learned but you can’t because you’re dead and not knowing just killed you). On Monday, I got notice at Pronet (http://www.pronetreno.com/) that there was going to be a career fair at the Grand Sierra in Reno (http://grandsierraresort.com/). About the time I was getting ready to go, I got a phone call from a potential customer. He wanted to know if I was the 20.00 flat rate guy (how can anybody work for that) and I told him no. He told me his computer was infected and I told him that I could go there in the afternoon. I told him that the first half hour was free, and that in that half hour I could at least tell him how much more it was going to take, or if it was worth fixing. This put me late to the job fair. I arrived at about 11:30 and it seemed like somebody must have told a few other people about this job fair. There must have been 300 people in line in front of me. I walked to the head of the line just to see how long it was. I was mostly going there to network and let people know about Blivit Design so I started handing out business cards to the people who were waiting in line. Once again, I’m networking with people who have no jobs and no money. I had about 30 business cards in my pocket and I handed out those (with free computer advice for anyone who asked for it) and then went out to my car to get some more cards. I got to my car and found maybe 30 more cards. I didn’t really have time to go home, so I just got those 30 cards and about 20 of the fliers that I had made up to hand out around the neighborhood. I decided to hand out the fliers first, so I started at the head of the line again. The line had moved since I had gone out to the car so there were no repeats. After I handed out all of the fliers and started in on the remainder of my business cards, some guy came out and told me “No soliciting in the hotel”. I thanked him, and told him OK. I walked around a corner and started in again of course. After all, I only had about 20 cards left. I’m pretty sure the way some people were taking the cards, they thought I was handing out coupons for free slurpies at 7-11 or something. When people don’t speak English, it’s kind of hard for them to understand me talking about computers to them. Well, it was fun and I did get a lot of cards handed out. So far, the phone hasn’t rung. I did call the guy who wanted me to work on his computer, and apparently he was able to get enough from our phone conversation to fix his own computer (or maybe the 20 dollar guy called him back). I went into Pronet to get my teaching kit last Wednesday and I was told that the class had been cancelled. They told me that only three people had signed up for the class, so they were going to have them come in next week. I really don’t understand this, because we’re all volunteers anyway. Nobody was informed the class was cancelled so we all took time out (from our busy days) to teach the class. I at least found out about the cancellation by going to Pronet so I didn’t have to drive all the way out to Reno town mall to find out about it. The people that they got to help me didn’t find out about it at all until no one showed up over there. After I found out that I wasn’t teaching, I went to mail my mom a bottle of Rum (who knew they won’t let you mail booze). Failing that mission too, I decided to stop in to several small businesses and see if they needed any computer help. Not really. I did have a really delicious burger at the place over by the shell station on the corner of Vista and Baring. I will find out the name and edit this post at a later time to fill it in. It was REALLY worth stopping in. The Bacon cheese burger with a Large drink was less than 5 bucks. I got back out to the car where I had unwisely left my cell phone, and found out that I had two panicked calls from my usual helpers for the Wednesday computer class. Nobody told THEM the class was canceled even AFTER I had shown up at Pronet having not been told myself. If tomorrow’s class is cancelled, I think I’ll just uncancel it and teach it anyway. Last Wednesday, I checked the voice mail on my phone and I’d received a message from the new class organizer for the computer class I have been teaching the last few weeks. I had to leave the Pronet meeting early on Monday and the person who had been appointed the new class organizer could not get a hold of me. I don’t know why she didn’t get contact information from Pronet or from the previous class organizer, but it didn’t happen. I found out I had been replaced as teacher. Somehow, I managed to get fired from a job that I wasn’t even being paid to do. I think that’s quite an accomplishment. They were upset at the performance of my students last week because only two people were successful at setting up their email address. It seems that when setting up a Hotmail account, if you guess wrong on the “Mystery Characters” at the end of the setup process three times, you are locked out of completing the sign up process for one day. Somehow, everybody in class but one did exactly that. You must understand that almost every one of these people have never sat down in front of a computer. Most can’t touch type so they don’t know where the keys are, and they’ve never used a mouse. The second person to get an email account that day was locked out of the Hotmail system, but I stayed after and helped them set up a Yahoo account. The reason we left Google Mail as a provider and went to yahoo was because we were prevented from finishing the sign up process on that program because of some kind of server problem at the Reno Job Connect office. I understand that they have fixed that problem. The reason I left Yahoo and went to Hotmail was because there was a second set of Mystery characters at the first use of the Yahoo account that I was afraid would push my students right 0ver the edge. Although I didn’t teach last Wednesday, I did help people in the class. There were 11 students and I helped the 6 people in the two rows in the back of the room. I absolutely did NOT allow them to fail to get their email accounts up. I’m not sure this is a good thing, as I did some of the work myself in getting the students set up. Since the class organizers are basing their idea of success on how many students get their email address set up, I guess this class will be seen as a ringing success. I’m not sure how many of the students I was “helping” will be able to get on a computer and actually USE their email account, but we will probably never hear about that. I looked at about five different free email setup accounts yesterday and they were all about the same. There is really no way of making them any easier that I can think of. You have to select a user name and password, and they all have the “secret question” and the “Mystery Characters” in the sign up process. If I teach the class this Wednesday again, I know what I will do differently. Before we do any computer instruction, I will have my students write down a user name and password. I will make SURE they write down a user-name and password. I will go to everybody’s desk and VERIFY THAT THEY HAVE WRITTEN DOWN A USER-NAME AND PASSWORD! This will end a lot of the confusion we have been having setting up an email account. As usual, I’ll keep you posted…. 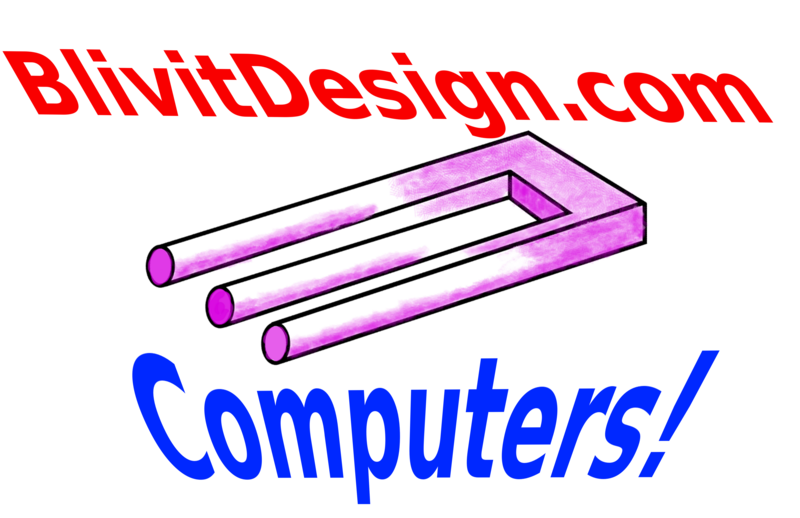 On Friday, I made up some signs with “BlivitDesign.com Computers!” and my special logo, and I put them up in strategic locations at the “Best in the West Rib Cookoff”. This is an annual Bacchanalia in Sparks where we pig out (!) on pork ribs, beer, corn on the cob, margaritas, and various other delights for about 5 days. I have since heard that this years Rib Cookoff had a record crowd of half a million people. The signs were out there where people could see them, but for some reason, it didn’t seem to generate any web traffic. My next try is going to be putting up signs on the roadside in a Burma Shave manner. (Oh yeah sure. I bet EVERYONE remembers Burma Shave….) I think I need to stress that the first half hour of computer service is FREE. I guess no business takes off over night. I do have another client waiting for me tomorrow morning. I think he is another person that has no money though. I had fun at the rib cookoff. I was there twice on Friday, once on Saturday, and once on Monday. Lots of good food (and of course, Great Basin Beer http://www.greatbasinbrewingco.com). I took some pictures with my phone camera. Check them out at http://www.facebook.com/album.php?aid=71423&id=1630646763&l=1d4609f6d8. My personal favorite was Butch’s on Friday at lunch time. That was when the ribs were cooked to perfection. I guess the winner this year was “Bone Daddy’s” but I never made it over to that place this time around. I bet somebody took my signs down on Sunday morning. I have no way of knowing. One person emailed me and told me he saw one of my signs. I have to write him back and find out when he was down there. I’ll keep everybody posted (all of my many fans) as to how the advertising campaign is coming along. This could take a while (what about flashing exploding signs?). Maybe I could stand out on the street corner dancing and waving around a BlivitDesign sign huh? Maybe I could get into shape doing that. One thing I have to do is get some bigger signs, and get some car door magnets for both my and my wifes car. Tomorrow, I’m off to teach my computer class again. I’m going back to Gmail, because Hotmail locked so many people out before they could finish signing up. (three strikes and you’re out for a day). As usual, I’ll keep you posted.